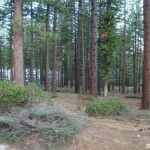 2451 Wagon Train Trl South Lake Tahoe CA offered at $89,900Attention Home Builders! Check out this Great value on a beautiful, buildable lot located in upscale Montgomery Estates. This lot has a high IPES score of 928 and generous coverage of 29%. The 2 vacant lots to the left and lot across the street are conservancy lots. It is close to Heavenly, casinos and Lake Tahoe. This fantastic parcel is a great location to build your dream home...Continue Reading!